Patrick Soon-Shiong’s NantWorks buys a controlling interest in hedge fund-owned Verity Health, which runs six California non-profit safety net hospitals previously operated by Daughters of Charity Health System under the Integrity Healthcare name. From Pithy Aside: “Re: Cerner wins/losses.Here’s the information from the 2016 and 2017 KLAS clinical market share report.” A reader previously subsetted the KLAS data in an attempt to focus on what he or she thought would be most interesting to Wall Street analysts, but the bottom line per KLAS (as commented here previously) is, “Acute wins for 2015-2016 for Cerner: 249 (this number includes 1 Soarian add on in 2015). Total Millennium losses for 2015 and 2016: 53. Cerner’s net growth is thus 196 acute hospitals for 2015 and 2016.” Certainly further segmentation by deal count vs. hospital count, organization type, bed size, accounting for multi-hospital deals like the DoD and Emerus, net-new customers vs. footprint expansions, migrations either way due to mergers, etc. could lead to further interpretation and speculation that may or may not add value. There’s also the unusual opportunity since CERN is publicly traded to simply look at the metrics Wall Street really cares about that go far beyond hospital count – revenue, bookings, and earnings, all of which reflect Cerner’s overall activities (not all of which involve hospitals) and the efficiency with which it operates its business. For that matter, share price since January 1, 2015 is the ultimate measure of company performance vs. Street expectations and the above real-time graph as I write this shows CERN (blue, up 1.1 percent) vs. the Nasdaq (green, up 29.3 percent). The reader also noted that some Soarian sites are trying to wangle out of their contracts to switch vendors claiming poor support, but I can’t say I side with them – they signed a contract for product that remains supported, and if company change of control was important to them, they should have put that – along with service level agreements if they left those out — into their contract’s terms and conditions. Weirton Hospital has sued Cerner claiming poor support, while Cerner sued PinnacleHealth for trying to walk away from its Soarian contract after signing with Epic. From Pinkeye: “Re: Epic. 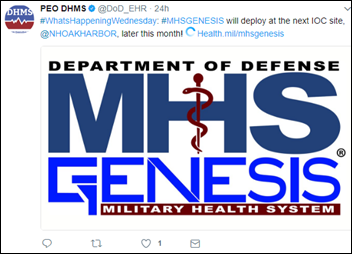 Hard to believe they didn’t bid on the Wisconsin DHS project if they have a viable behavioral health strategy. I’m also curious whether Allscripts/Netsmart bid.” Epic sent me a note after I mentioned that the company had chosen not to bid on the project, saying it wasn’t a big enough deal to interest Epic. I haven’t seen a list of the five bidders. Health IT websites created the self-serving notion that it’s cleverly-observed big news when a customer in Wisconsin or Missouri chooses Cerner or Epic, respectively, but that’s ridiculous. From Nuance Hospital Customer: “Re: Nuance outage. Escription staging environment testing is in process, with plans to bring the first client on board. Rebuilt speech engines. They just announced that they are in process of updating employee laptop antivirus software and installing encryption (!). Over 200K physicians are on an interim solution, but still no commitment to make clients whole — only offering clients short-term use of Dragon Medical. I can only speak for our organization, but we have had over 10 staff working around the clock since this outage to review options and stand up outside transcription service. This is very poor remediation.” Unverified, but seemingly solid since the reader emailed from their hospital account. Nuance has issued minimal public information, instead providing status updates via customer conference calls. Some systems remain offline 10 days after the initial malware incident. From NotPetya: “Re: Nuance outage. People are acting like they’re innocent victims of a cyberattack. Doesn’t this situation show what happens when you don’t upgrade your software? NotPetya exploits the same weakness as the May 4 outbreak and systems should have been patched.” I don’t think Nuance has confirmed that it was hit by NotPetya, but assuming that’s the case given the incident’s timing, it would seem that it had a PC running somewhere that didn’t have Microsoft’s Eternal Blue exploit patch from March 2017 (MS17-010) installed, which also protects against the WannaCry strain. However, even someone as cynical as I would be hesitant to suggest that the company was negligent given the lack of facts, instead suggesting that every organization check every PC on the network to make sure they are running updated versions of Windows and antivirus. From Crank Rod: “Re: HIT influencers. What do you think of this list that a Twitter monitoring service company assembled?” I question the premise of this list (and others like it) that assumes that hyperactive Twitter users must, by definition, be influential. I’ve never heard of most of the Twitter accounts listed, follow few if any of them, and note that their Twitter activity is often dominated by attention-seeking retweets and insight-lite comments that fail to rise above the level of social media circle-jerkery. I’ve also noticed that the real-world accomplishments of the anointed Twitterati are often much more modest than their outsized social media presence would suggest and that their self-assigned labels of “disruptor” and “innovator” sometimes ring hollow given their lack of personal success within the system they claim to be qualified to disrupt (it’s perhaps harsh to say that, “those who can’t, Tweet,” but sometimes that seems to be accurate). I’m happy for those named, especially for those whose self-validation demands it, but it’s just not something I care one iota about. I doubt many CEOs and other industry leaders are anxiously waiting for the winners to be named so they can call them up for advice. From Money In the Banana Stand: “Re: #HIT100. Is it just me, or is this just another glad-handing campaign where the social media-verse celebrates the over-tweeters, many of whom have never even worked within a health system? While I find social media to be an effective medium to share, collaborate, inform, and educate, I am increasingly annoyed as I find folks have gotten away from why we are in this industry in the first place. In fact, I find several of these individuals exclusively making a living by talking about what the industry needs to do in social media and at conferences, but have no successful business or job within the industry. I am appreciative of those who HAVE worked in the industry who share their expertise and strategic thinking, but have had just about enough of the ‘marketers’ who are just recycling marketing and self-promotion. The tipping point for me was receiving countless messages from people ‘campaigning’ for my vote. Seriously?” I received this comment several hours after writing mine above, which was triggered by a similar but different “influencer” measure. Some of those folks don’t seem to have real jobs and are light on (a) healthcare-related education; (b) work experience; and (c) accomplishments. 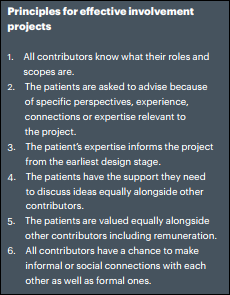 I apply the same standard to those who produce blogs, publication articles, or conference presentations – if you’ve never worked in a position of significant responsibility in healthcare IT, it’s hard to fathom why those who have should trust your assessment or value your opinions. From Informatics Professor: “Re: alerting privacy officers of users accessing unneeded patient information. The example of accessing records of a patient not seen in the past six months nor scheduled for an encounter implies that the only rationale for accessing a patient chart is direct treatment. There are other circumstances in which chart access is needed, such as data retrieval and quality audits.” The original poster suggested flagging such access for manual review, which would then uncover the extenuating user circumstances. The alerting could take user role into account, perhaps raising a more vigorous flag if the credentials used to look up inactive patients were those of a nurse aide rather than a quality analyst. 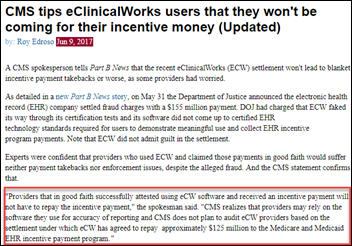 From ECW Watcher: “Re: the HIMSS-owned publication’s ‘breaking news.’ They’re a month late.” The publication ran a piece Thursday (along with breathless tweets and an email blast) indicating that CMS won’t make users of EClinicalWorks repay their incentive payments. The 12-paragraph story (nearly all background filler) contained three quoted sentences that it attributed to “a CMS spokesperson.” A competing publication ran the same information with the same quotes on June 9 (screenshot above), which also helpfully directed readers to a CMS FAQ (from months before that, but not naming ECW specifically) instead of omitting links for fear of looking less than omniscient. It’s early July – do you know where your interns and first-year hospital residents are? (answer: driving your experienced doctors crazy with their inexpert questions, ordering tests and meds better suited for textbooks than a busy ED, consulting all but the most basic problems out, and requiring constant hand-holding to avoid harming patients). This week on HIStalk Practice: Montana clinics come under fire for lack of interoperability. 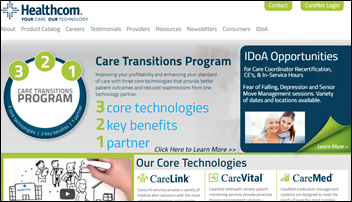 Hamakua-Kohala Health rolls out Medfusion patient portal. CMS develops new QPP resources for physicians in rural and/or underserved areas. This year’s digital health investments will likely make 2017 a record-breaking year. Physicians – no matter their type of employer – are still frustrated with EHRs. 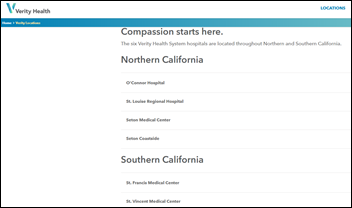 Carepostcard launches to help patients thank, find compassionate providers. 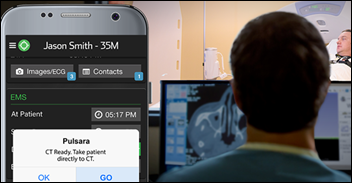 Home monitoring technology vendor VRI acquires competitor Healthcom. 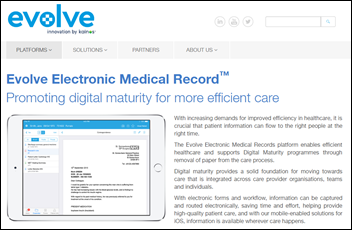 In Ireland, Saolta University Health Group chooses the Evolve clinical document management system of Northern Island-based Kainos. Dialysis clinic operator Fresenius Medical Care North America licenses Forward Health Group’s population health management system. Patient engagement app vendor Fitango Health will use InterSystems HealthShare Connect to develop a post-discharge action plan platform. 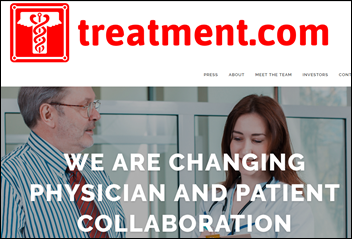 Minnesota-based Treatment.com announces its Merlin artificial intelligence platform for diagnosis and treatment. FirstHealth of the Carolinas (NC) goes live on Epic. CIO Dave Dillehunt is leftmost in the above photo. Baylor Scott & White Health – Grapevine (TX) goes live on Pulsara, a smartphone-based app that allows first responders who are transporting potential stroke patients to coordinate with the ED on the way to the hospital. Eisenhower Medical Center (CA) goes live on Epic, apparently replacing McKesson Horizon Clinicals it chose in 2007. 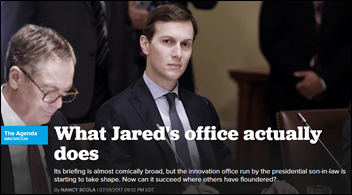 Politico suggests that the VA’s abrupt announcement that it will implement Cerner under a no-bid contract was influenced by the White House’s Office of American Innovation, run by presidential son-in-law Jared Kushner. VA Secretary David Shulkin met with Kushner’s team, but says the decision was made independently. In Australia, a professor says he’s not convinced the country’s health system is ready for digitization following news that the Medicare card details of all Australians are listed for sale on the Dark Web. He notes that the government’s systems use somewhat primitive security measures, as well as the fact that the information is also stored on provider systems with varying degrees of security. He’s especially worried since the government’s centralized medical record is operated under an opt-in model that will change to opt-out in 2018. The professor advocates the “100 points” identity model as used for firearm permit applicants, in which many forms of ID can be presented as long as their weighted security value adds up to at least 100. In England, the Information Commissioner’s Office chastises Royal Free NHS Foundation Trust for inappropriately providing patient information to Google-owned DeepMind Health without their consent, requiring the trust to align its procedures with law, complete a privacy assessment, and commission an audit of its DeepMind trial project. 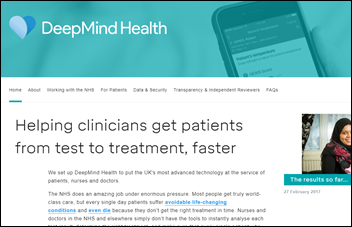 Speaking of DeepMind Health, the hired independent review of the company’s activities finds that “the digital revolution has largely bypassed the NHS” as doctors use Snapchat to insecurely share patient photos and NHS holds “the dubious title of being the world’s largest purchaser of fax machines.” It notes that the original, much-criticized agreement with Royal Free Hospital contained a “lack of clarity” that has since been corrected in a new agreement and recommends that DeepMind cooperate fully with the ICO’s recommendations. Panel members also voted to have DeepMind Health pay them an honorarium instead of donating their time for free. A Cisco investigation finds that the Ukraine-based tax software company whose updates were used to globally propagate the recent NotPetya malware attack had not updated its servers since 2013, resulting in at least three penetrations in the past three months. 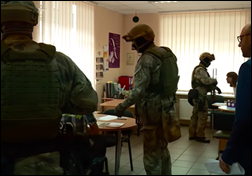 Police raided the office and seized its servers, with the unintended consequence that customers who are required to use its software are now sharing older versions of it via Google Drive and Dropbox links, exposing them to potentially booby-trapped copies. 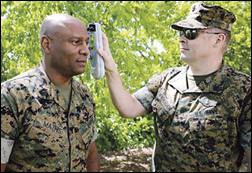 A team from Marine Corps Base Quantico develops Infrascanner, a portable infrared device that allows detection of intracranial hematomas on the battlefield, replacing the old system of a paper-based evaluation form and potentially avoiding evacuation for unnecessary CT scans. A New York Times report about low-quality nursing homes concludes that stricter oversight (fines and seldom-enacted threats to halt CMS payments) don’t seem to deter them since they just keep operating with poor metrics. The lawyer of a resident who is suing one of them says fines are just a cost of doing business for their large-corporation owners, especially since federal budget cuts allow only 88 nursing homes to be labeled as “special focus” even though regulators recommend such scrutiny for 435 facilities. Visage Imaging releases an update for its Ease mobile app that adds support for video and encounters-based workflow. I’m a Twitter HIT influencer, blogger AND Conference presenter/impressario who hasnt worked on hospital since a high school job as an orderly in the 1970s. I may not agree with MrH about the value of my opinions overall, but on the issue of top 100 lists, he’s right. They’re stupid. If your first sentence includes the ‘fact’ that you are in influencer, you just might not be as big of an influencer as you think. How can anyone call themselves things like disrupter, influencer, etc?????????? I have tweeted since 2009. I signed into the social media networking event during HIMSS, and they asked me to create a name badge with one of two titles imprinted, 1) Influencer; 2) I cant recall exactly, but it was and something along the lines of “observer” or “novice”. I chose the latter, as who can declare that they themselves are an influencer? Then I entered the party, and discovered that with the exception of the HIMSS Students, everyone was identified as an influencer.. It really made me realize that this “movement” has gone too far. I was in a sea of self-declared influencers and disrupters and wanted to run to go with REAL industry people who care more about the work than their self promotion/declaration. 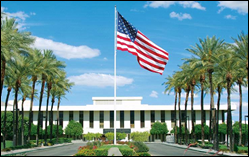 I agree with Nuance Hospital Customer and have been told much of the same information. We have been all hand’s on deck in IT and HIM since 6/27 to compensate for the loss of eScription. We are further rolling out DMO voice recognition. Most of our providers have been champs but there are always a few that spend more time complaining than learning. Everyone is exhausted. I’ll respectively call BS that the state-wide mental health program in Wisconsin wasn’t big enough business to interest Epic. They’re actively marketing to critical access and small community hospitals with the Utility, Sonnet versions of Epic. You can’t have a self-proclaimed strategy to work down market with the likes of critical access hospitals and then pretend a $33M contract is of no interest. It’s negligence. Any organization that didn’t evaluate it’s PC fleet for vulnerabilities and deploy the MS patch (which only existed because the threat was so dire that MS opted to patch a system it wasn’t even supporting anymore) after dodging the WannaCry bullet via pure dumb luck and amateurish malware code has to ownresponsibility. There are GA software tools that can do a network crawl and provide a report of vulnerable systems. As Epic’s marketing gets bolder, it continues not providing the basic background information on its studies which would make them credible, for example citing their sources of data. They have done this with a number of “research findings” over the past year so it is not surprising. 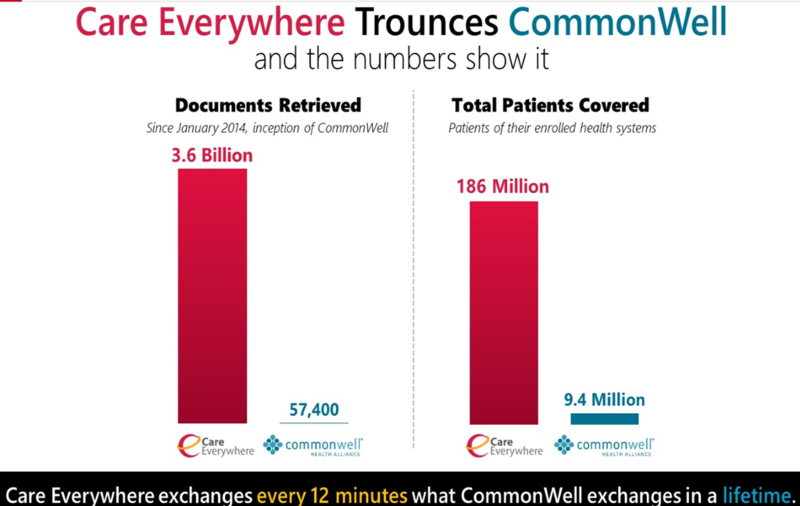 I am not in Cerner’s camp but the “Documents Retrieved” and “Total Patients Covered” numbers on CommonWell in this marketing material do not even pass the smell test. Why is it that the traditionally critical thinking bunch that read HISTalk do not question uncited research when it is provided by Epic but would do so when it was provided by most other organizations? 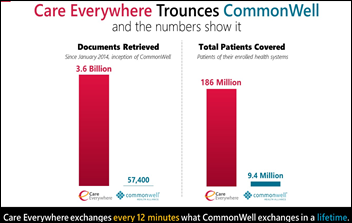 Unrelated to your comment, but I remember when Cerner put up their real time Commonwell Exchange website – intended to show actual live data exchange between sites. A quick examination of the page source revealed that they were randomly generating false exchange events with some very poorly named functions. Much of the Cerner demo process is screen shots and paint so why should the common well stuff be any different? A few years ago, I put too much interest and effort into this whole “HIT100” thing. Now I’ve seen the light and I abstain. Indeed, when the primary job of one of the top 5 on 2016’s list is “dog walker,” then it’s pretty clear that it’s a popularity contest. Where’s my #PinkSocks? I need to put them on and sing Kumbaya with me, myself and I.
NantWorks buying Verity Health control is potentially very sad for the communities they care for. I hope that he bought them because he believes in their mission, but I suspect he bought them because they were a cheap way for him to acquire some customers that will be forced to use his Nant-whatever products. Being purchased by NantWorks is the best thing that could have happened to those facilities. They’ll be better equipped, better managed, and provide better patient care than they have in years with modern medicine approaches that aren’t available in many other areas. NantWorks should be applauded for taking things into their own hands to update, modernize, and innovate in our health care system. Does this threaten you Dr. M? I”m sure it does. It might require your organization compete with people who will provide better, more cost effective, and modern cures for diseases. It’s unfortunate so many in the medical profession once they receive their license stop doing anything new and stop improving. His Nant-whatever stuff + whatever other products Patrick SS or NANT have an equity interest with…cough cough Allscripts. Seriously, the Wisconsin DHS is kinda a disaster area, with the mental health network (or at least large parts of it) unable to get Medicaid or Medicare certified by the local certification agency- the Wisconsin DHS. That’s right folks, they won’t even certify themselves. And you wonder why Epic skipped it? To be clear, Epic is saying they’re more interested in the 10 year financial gain they’d see from a critical access hospital rather than a state-wide network of hospitals. Well ok then. I guess it is a good thing they are privately held because that explanation defies all logic. Corey, you are assuming it would be a one to one ratio, which is silly. 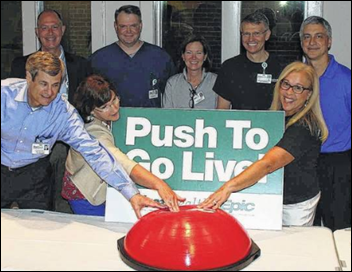 Epic could do 30 critical access hospitals with the resources that it would take do do the state wide hospital network. When will this self promotion, praise end? I’d like to get back to what I’ve been working toward for since I decided what to do for a living at 16!